Backed by a grant from the National Institutes of Health (NIH), the Emory-led, multicenter, randomized, double-blinded study (ProTECT III) will enroll 1,140 patients at 17 medical centers in 15 states. Atlanta’s Grady Memorial Hospital will serve as the lead center, led by Emory University School of Medicine faculty researchers, in concert with colleagues from the Morehouse School of Medicine. 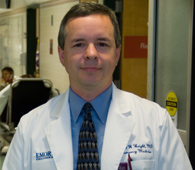 David Wright, MD, assistant professor of emergency medicine at Emory School of Medicine is the national study’s lead investigator. Michael Frankel, MD, Emory professor of neurology, will serve as site principal investigator of the clinical trial at Grady. The University of Michigan will provide the central study oversight and coordination. Data analysis will occur at the Medical University of South Carolina. Donald G. Stein, PhD, Asa G. Candler Professor of Emergency Medicine at Emory School of Medicine and director of Emory's Department of Emergency Medicine Brain Research Laboratory, pioneered discoveries regarding the effect of progesterone following traumatic brain injury – first discovering the neuro-protective properties of progesterone in the laboratory more than 25 years ago. According to Michael Young, CEO of Grady Health System, benefits from the collaboration between the region’s only Level I Trauma Center and Emory University researchers and physicians will reach far beyond the city and state. Traumatic brain injuries have also been labeled the “signature wound” of U.S. soldiers in the field of battle – particularly in recent conflicts in Iraq and Afghanistan, and the number of military personnel impacted by blunt trauma traumatic brain injury has risen dramatically in recent years. While greater improvements in armored technology have spared many more lives, more soldiers are now facing the consequences of their brain injuries. The development of progesterone therapy could allow more of these soldiers to return home with significantly reduced therapy needs and costs. “Effective drug therapies are desperately needed for traumatic brain injury. Progesterone has shown protective effects in animal models of head injury, and was tested for safety in a small clinical trial” says Walter Koroshetz, MD, deputy director of the National Institute of Neurological Disorders and Stroke (NINDS), the NIH institute that is providing primary support for the study.